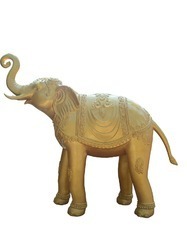 Pioneers in the industry, we offer welcome elephant pair-in golden color, welcome elephant - in golden color, beautiful royal big elephant statue, elephant welcome statue for a traditional decoration, metallic jharokha and welcome elephant statue for entrance from India. 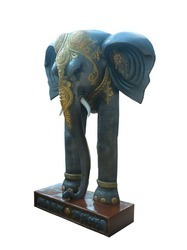 A gorgeous lifelike elephant statue from our Life Size Animals Collection. This gorgeous beauty is part of a collection of hand-crafted memorabilia replicas. It is sure to be a perfect piece to add to any collection.. The incredible details depicted on this elephant truly make it museum quality. It is sure to attract crowd's attention and is a wonderful conversation piece. This collectible statue is made from durable materials using cast resin mold mixed with fiberglass. It is hand painted to the highest detail by professional artisans whose skillshave been passed down to them for generations. 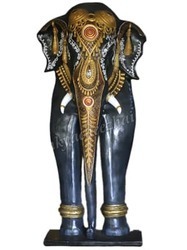 An Exquisitely hand carved royal elephant also known as Ambabari Elephant, this artistic FRP product sculpture is completely handcrafted by skilled artisans from the rural areas of India,this FRP product Masterpiece is a great item for gifting purpose, a unique Artifact for Art Lovers,&amp; can be a great marvel of attraction for your living rooms. So, get these beautiful Pair and give your home or office a welcoming ambiance. 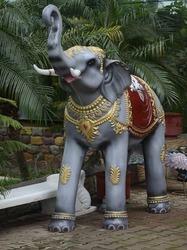 This Elephant is offered to provide a soothing touch to the surroundings. Bearing beautifully handcrafted finish, Its flawlessly crafted and aesthetically designed construction standards also make it the preferred choice of customers. 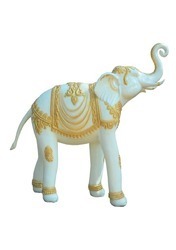 This elephant is highly suitable to be used for As Vastu Product.T his is made up of Excellent quality of Fibre. This is made up of making a right use of available superior craftsmanship techniques to create the right magic in the offered exclusive collection, our extensive knowledge also helps us to perfectly understand and meet clients requirements. 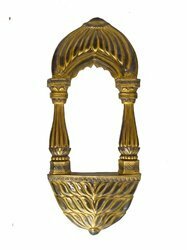 Eye Catching handcrafted Antique finish FRP Jharokha. Our Fiber artifacts stand a class apart in quality, design and execution. Each one can be called a masterpiece with the beauty it embraces in its carvings. The Design in fiber are the most interesting object of desire among our fascinating range of handicrafts. Another interesting range is that of the Jharokha. A masterpiece for your interiors! A never before range awaits you...!!! This product featuring artistic and ornamental touch. This Elephant is offered to provide a soothing touch to the surroundings. Bearing beautifully handcrafted finish, it’s flawlessly crafted and aesthetically designed construction standards also make it the preferred choice of customers. 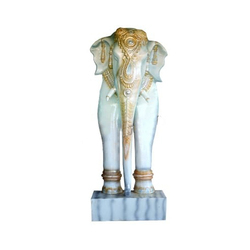 This elephant is highly suitable to be used for decorating Entrance of your place. This is made up of Excellent quality of Fibre. This is made up of making a right use of available superior craftsmanship techniques to create the right magic in the offered exclusive collection, our extensive knowledge also helps us to perfectly understand and meet client's requirements. This product Featuring artistic and ornamental touch. This Elephant is offered to provide a soothing touch to the surroundings. Bearing beautifully handcrafted finish, Its flawlessly crafted and aesthetically designed construction standards also make it the preferred choice of customers. 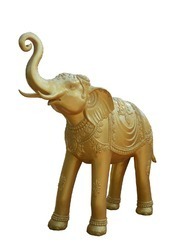 This elephant is highly suitable to be used for decorating Entrance of your place. This is made up of Excellent quality of Fiber. This is made up of making a right use of available superior craftsmanship techniques to create the right magic in the offered exclusive collection. Our extensive knowledge also helps us to perfectly understand and meet clients requirements. Looking for Welcome Elephant Statue ?